Wilton will apologize for comments made by members of its student section for chants directed at a New Britain basketball player during a state tournament game Friday, March 8, 2019. Through an official statement released Tuesday afternoon, New Britain Superintendent Nancy Sarra has responded to allegations that some Wilton High School students were chanting a racial slur during Friday night’s boys basketball state tournament game in Wilton. “On Sunday, we were made aware of a disturbing Facebook video circulating online that features the chanting of a perceived racial slur, “black face,” at our New Britain High School basketball players,” Sarra wrote. “Everyone knows that this language is unacceptable, but what was more disturbing was that it was putting voice to a group sentiment. 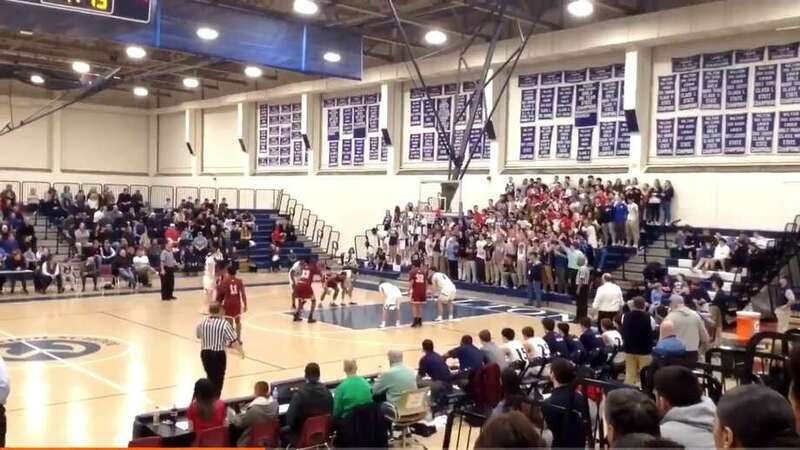 Wilton school officials told Hearst Connecticut Media on Monday they spoke with members of the student section separately, and each student stated the chant was “Leg Days,” referring to the size of a New Britain player’s legs. Sarra’s statement came in response to a 16-second video posted on the Twitter acccount of a New Britain High School teacher Sunday, in which a New Britain player is preparing to shoot free throws when Wilton student fans standing in bleachers behind the basket start to chant. “Please listen to what Wilton High School’s student section chanted to our team,” wrote the teacher in the Twitter post, which was sent to Hearst Connecticut Media and other outlets. At halftime of the Division II state quarterfinal game, New Britain players told their coaches that the Wilton students were chanting “Black Face,” according to New Britain Athletic Director Len Corto. Administrators from both schools discussed the incident via phone calls Monday, and Wilton High Athletic Director Chris McDougal talked with students who attended the game. In the video, one Wilton student in the front row of the bleachers appears to be doing leg squats during the chants. Smith, McDougal and Wilton High Principal Robert O’Donnell jointly signed a letter of apology that was sent to New Britain administrators Tuesday. “… on behalf of the entire Wilton community, we wish to convey a sincere apology that anyone would come into our athletic facilty and believe they heard a racial slur from our student body,” wrote the three Wilton administrators. “In Wilton, we have zero tolerance for such behavior, and inappropriate speech or actions by any member of our Wilton school community will result in severe consequences. “We accept Wilton’s apology in words and look forward to apology in action,” Sarra wrote in her statement. The apology was Wilton’s second in the last three years. At a football game against Danbury in November 2016, Wilton students were accused of chanting “build the wall” — a reference to President Donald Trump’s campaign promise to build a wall along the southern U.S. border with Mexico. That apology followed a letter from Danbury Mayor Mark Boughton to O’Donnell, according to a story in the News-Times. “I respectfully request a formal apology to our student body and to our community at large,” Boughton wrote in the letter. In a Twitter comment regarding the New Britain video, Stamford resident Debbi Simms wrote that her son was the target of insults by Wilton fans during a game Feb. 18 at Wilton High School. “Snitch and You’re Going to Jail was shouted at my son a few weeks back,” Simms wrote on Twitter. During a phone interview Tuesday afternoon, Simms expounded on her online comments. “At the end of the game, I saw my son (a sophomore on the Stamford High boys basketball team) heading toward the Wilton student section and an adult holding the students back,” Simms said. “He told me some of the Wilton kids were yelling at him and saying he was going to jail. He’s 15-years old and a good kid; he’s been playing sports since he was 8-years old and I’ve never seen him react like that, so I knew it was something bad. The alleged comments were not reported to members of the Stamford athletic department. Smith, the Wilton superintendent, said he had not heard about Simms’ complaint.